The Jura Mountains where the La Transjurassiene is held are only a stone’s throw from Geneva International Airport in Switzerland. It’s an easy 2 hour train trip from the airport via Nyon to La Cure then only 3 kilometres to Les Rousses, the start of Saturday’s 50km classic and Sunday’s 57km freestyle event with bus transport available to Lamoura for Sunday’s 76km freestyle event. Considering the varied weather (sun, snow, rain) and snow conditions (dry, powdery, wet, sloppy, muddy) during the week prior to the La Transjurassiene, organisers did a tremendous job planning ahead to ensure the weekend of races could eventuate. For example, on the Tuesday prior whilst skiing between Les Rousses and Bois d’Amont we came across a team of 5 grooming machines pushing/farming/packing snow from nearby fields to make a 30cm deep track. Despite torrential rain followed by snow later on Friday, the track held……just! Strategically place drainage ditches were also hurriedly dug just prior to Saturday’s race. On Friday as the rain poured down, skiers were grateful for the opportunity to be off the snow to pick-up bibs. It was a social affair in Morez as everyone tasted the treats of the Jura Mountains, speculating about when the rain would turn to snow, what wax to use and how much damage there would be to the track. The Worldloppet brunch was a good opportunity to catch up with Worldloppet friends from different countries and share stories and adventures. 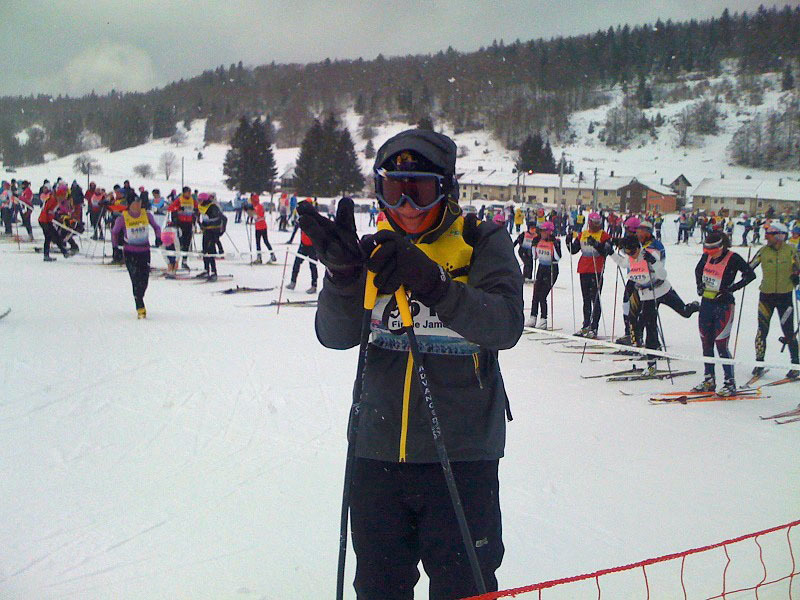 On Saturday morning some 800 skiers lined up at Les Rousses for the start of the classic event. Skiing shoulder to shoulder with 3 classic tracks laid it was important to stay alert as no-one wanted to fall over and slip off the platform of snow through the valley paddocks. The steep hill at Bois d’Amont held out surprisingly well with some mud coming through before reaching the fresh dry snow of the higher elevations at Les Combettes. Winding through the forests to Les Ministres was a delight with great classic tracks. The descent to Bellafontaine was exciting, followed by a pleasant meander through the valley visiting small villages each with their own drink station and cheering crowds along the way. On reaching the drink station at Le Pré Poncet I thought the climbing was just about over but that was not to be as a different route from the race profile was taken. It was a sting in the tail; a surprise final 10 kilometres involving more climbing than expected with Saturday’s ascent over 1,000 metres, with few kilometre markings in the later part of the race. It would benefit racers if they knew beforehand that there had a significant route change especially where it involved significant more climbing. The classic race was closer to 53 kilometres than 50km which was tough when you hadn’t anticipated this or the extra hills. Sunday’s route was changed too with the loop to Switzerland being excluded so the 76km and 57km races were short; because of the increased hills at the end no-one minded the shorter distance everyone was just happy to make to make the finish-line of one of the toughest Worldloppet races, with 76km skiers having climbed more than 1,300 metres. Queues in Sunday’s race in particular gave skiers an opportunity to catch their breath for the next series of hills, though the wait in Les Rousses was some 10 minutes or so. The lack of kilometre signs on Saturday was rectified on Sunday which was extremely helpful especially for tired skiers who didn’t know the course. Saturday’s weather was a mixture of snow and rain with the finish at Lamoura in continual rain. On Sunday it was snowing intermittently in the morning with some wind but by the finish in Lamoura the sun was shining, a welcome change. 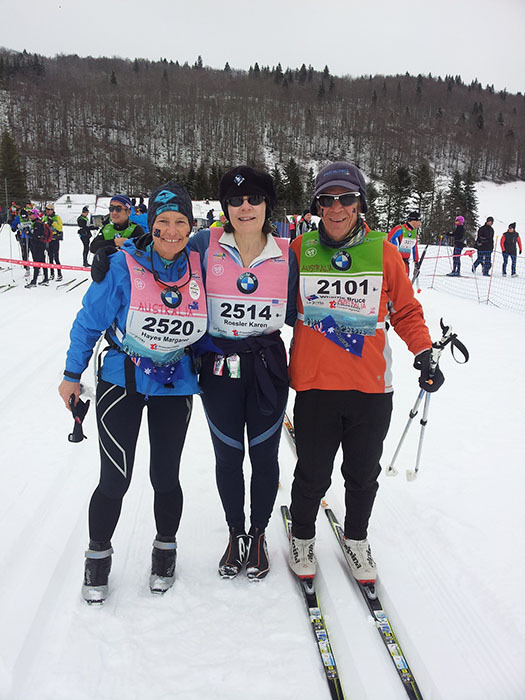 It was great to have so many spectators especially for Sunday’s race who cheered on weary skiers. Having names printed was bibs was a bonus as many spectators were calling participants by names to cheer them on. Congratulations to the organisers who did an outstanding job despite difficult snow and weather conditions to contend with. Well done to the 4,500 skiers as it was a challenging course with challenging weather and some patient uphill queuing. 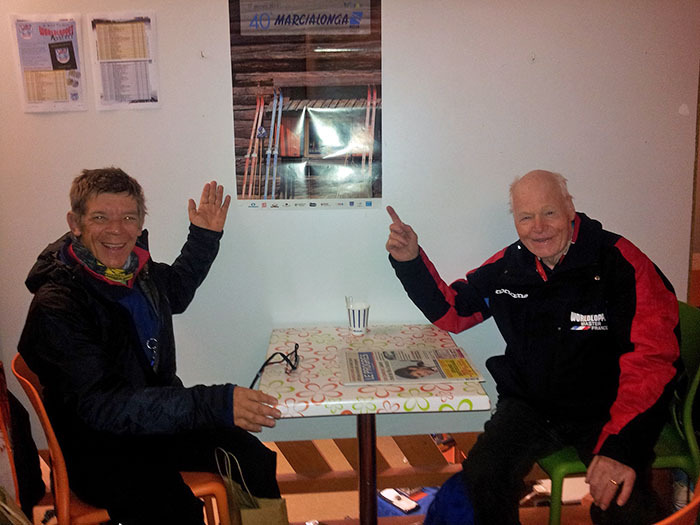 A special mention to the hardy skiers who completed the Ultratrans the 50km classic and 76km freestyle events.